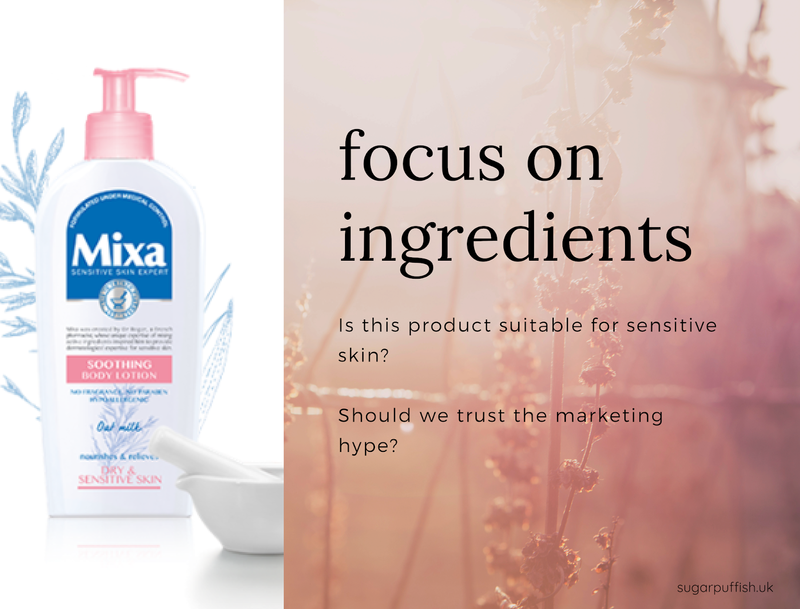 Ingredient Review: Mixa - body care for sensitive skin? I'm seeing many rave reviews for Mixa body lotions so I thought I would take a closer look at the ingredients. Mixa list all their ingredients online so nothing to hide and I've used their website as my point of reference. The tag line "Created in a French pharmacy in 1924. Inspired by traditional apothecary ingredients" is an interesting one when looking at the formulations. For me the word "apothecary" inspires imagery of herbal treatments and Mixa is far from that. The "Our Ingredients" page doesn't give the full picture, it simply lists the "nice" ingredients - allantoin, cold cream, coriander oil, oat milk, panthenol, urea and vitamin E.
Dig a little deeper and you'll find full ingredients listed on individual products. Straight away I can see why this is an affordable brand as the top ingredients across the range are water, paraffin, propylene glycol, dimethicone. There are few natural ingredients - shea butter, oat milk, sunflower seed oil. Dimethicone and mineral oils coat the skin, providing the slip and silky feeling but they offer no healing benefits. Your dry skin will be banished whilst using these lotions but once you stop the problem returns because you are not treating the underlying condition. I noticed the phrase "Dermatologically tested skincare for dry and sensitive skin" and if you didn't know already it holds very little value. It simply means that the product was reviewed by a dermatologist and like the term "hypoallergenic" it is not regulated. It certainly doesn't guarantee it will suit your skin. I appreciate cost is an important factor and some people won't look to natural and organic skincare because they make an assumption about price. However there are affordable natural brands as mentioned in my article Natural and Organic Skincare if you are on a budget - under £10. If you experience sensitive and dry skin then shea butter or carrier oils can be an effective and inexpensive option. Look out for independent brands who are not spending money on marketing and fancy packaging so can keep their costs down. The RRP on Mixa body lotions is £6.49 and brands like Jason (£7.49), Organic Surge (£7.95), Sukin (£9.95) and Handmade Naturals (£7.95) cost a little extra but you'll use less product in the long run and you should see a difference in your skin. My intention with this article is to highlight that it can be worthwhile paying attention your to ingredients. Of course I champion natural products because I speak from experience. For many years I suffered terribly with dry and flaky skin and there was a noticeable difference when I switched to green beauty.